The utility company «Referral Hospital «Panacea» has been going more than 15 years in the market of rendering of medical services. The utility company «Referral Hospital «Panacea» has a license of medical practice of the Ministry of Public Health of Ukraine. The license’s serial number is AG 597398. Communal institutions for Children Territorial Medical Association (CI "CTMA") was established in accordance with the decision of the City Council of Yevpatoria № 23-3/49 from 19.06.1998 year. (Certificate of state registration of the A00 from 28.08.1998 № 442 192 ), and operates on the basis of the Regulation approved by resolution of the City Council Eupatorium № 24-20/7 from 28.04.2004year . 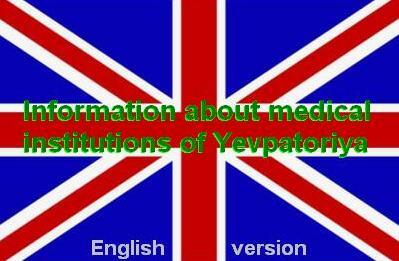 The communal enterprise of health service “The Yevpatoriyan centre of the first medical and sanitary aid” (CEH “YCFMSA”) is situated: Nekrasov St.39, Yevpatoriya T.97000. The chief of CEH “YCFMSA” is Zhuk Vasyliy Dmitriyevych. The communal enterprise of health service “The Yevpatoriyan centre of the first medical and sanitary aid” is a multiprofiled enterprise and its working hours are from 7.30am till 8.00pm every day( except of Sunday), during the day-offs and national holidays a doctor on duty works from 8.00am till 2.00pm. The Yevpatoriyan Maternity Hospital is located in the center of the old town of Yevpatoriya, close to the Black Sea shore. Since 2001 the Yevpatoriya Maternity Hospital has consecutively received the honorary title of Baby-friendly Hospital as a part of the Baby-friendly Hospital Initiative (BFHI) launched by the World Health Organization (WHO) and UNICEF in 1991. Since 2011 the Yevpatoriya Maternity Hospital has also been awarded an honorary title of The Establishment of High-quality Health Care.